Department of Mathematics, Narayana Educational Institutions, Bangalore, India. The aim of this note is to prove some well-known results related to the Fermat-Torricelli point in a new prominent way. The Fermat point is named for the point which is the solution to a geometric challenge that Pierre Fermat posed for Evangelista Torricelli, who was briefly an associate of the aged Galileo. Fermat challenged Torricelli to find the point P in an acute triangle ABC which would minimize the sum of the distances to the vertices A, B, and C. The triangle need not actually be acute, but if the largest angle reaches 120 degrees or more, then the vertex at the largest angle is the solution. 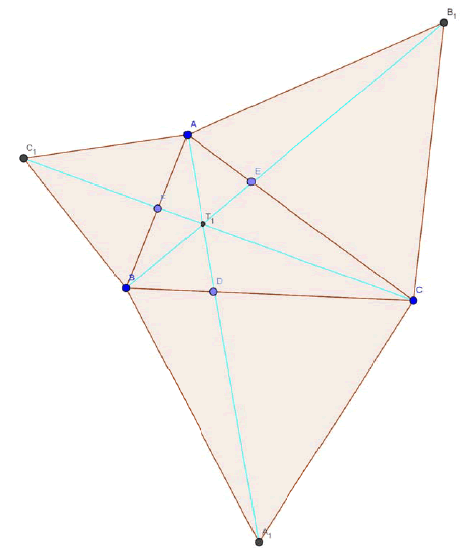 For a general solution, one approach is to construct equilateral triangles on each side of the triangle (actually only two are needed) and draw the segments connecting the opposite vertices of the original triangle and the newly created equilateral vertices. They intersect in a point which is the solution. The point is called the Fermat point. The more details about this point and its generalizations is in [1-4]. In this note we will try to establish the very fundamental results related to this point. Further simplification gives required conclusions. If Triangle ABC is an arbitrary triangle (whose all angles are less than 120 degrees) let the triangles A1BC, B1CA and C1AB are equilateral triangles constructed outwardly on the sides BC, CA and AB of triangle ABC then AA1, BB1 and CC1 are concurrent and the point of concurrence is called as First Fermat Torricelli Point(T1) or Outer Fermat Torricelli Point (T1 ) . Let D, E and F are the point of intersections of the lines AA1, BB1 and CC1 with the sides BC, CA and AB. The lines AA1, BB1 and CC1 are concurrent and the point of concurrence is called as First Fermat Point (T1). Triangles A1BC, B1CA and C1AB are equilateral triangles constructed outwardly on the sides BC, CA and AB of triangle ABC then AA1, BB1 and CC1 are equal in length. (For the recognition sake let us call the lines AA1, BB1 and CC1 as Fermat Lines) . Using the above relation and lemma-1 we can find the proportionality constant K and by replacing the value of K in AT1 = (S1S2+S1S3) K we can arrive at the required conclusion (b). Now using (b) we can prove the conclusion (c). 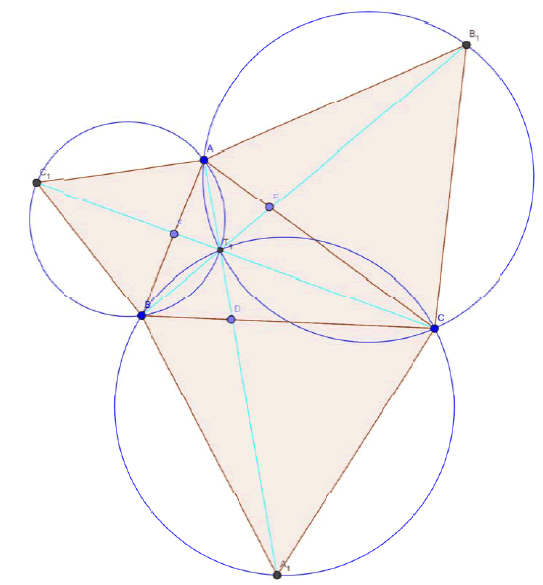 Triangles A1BC, B1CA and C1AB are equilateral triangles constructed outwardly on the sides BC, CA and AB of triangle ABC then the circumcircles of the Triangles A1BC, B1CA and C1AB conccur at T1. We need to prove that set of the points are concyclic. Similarly we can prove the remaining two relations. Using theorem – 3, lemma-1 and by little algebra we can prove the conclusion (a). This finishes proof of conclusion (b). When one of the angles of the triangle is 120° or greater, then the Fermat point (which still exists) is no longer the point that minimizes the sum of the distances to the vertices, but the minimal point is located at the vertex of the obtuse angle. Clearly Theorem-3 derives this fact. The author is grateful to the creators of the free Geogebra software, without which this work would have been impossible and the author is would like to thank an anonymous referee for his/her kind comments and suggestions, which lead to a better presentation of this paper. Mortici C. A note on the fermat-torricelli point of a class of polygons. Forum Geometricorum. 2014;14:127–128. Vijay Krishna DN. Weitzenbock inequality – 2 proofs in a more geometrical way using the idea of lemoine point and Fermat point, 2015. De Villiers M. From the Fermat point to the De Villiers points of a triangle, Proceedings of the 15th Annual AMESA Congress, University of Free State, Bloemfontein. Sándor NK. The metric characterization of the generalized Fermat points. Global Journal of Science Frontier Research Mathematics and Decision Sciences.2013;13. Paul Yiu. On the Fermat lines. Forum Geometricorum. 2003;3:73–81 .